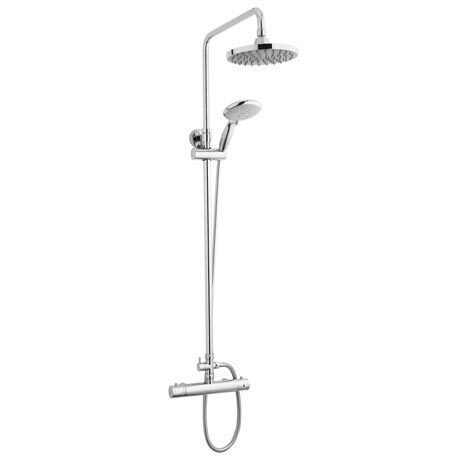 The minimalist thermostatic bar shower valve with telescopic riser kit from Ultra is part of our contemporary collection of bathroom products. The minimalist styling of this shower is present in all its features from the sleek chrome valve to the stylish shower head. Q. Does this unit have 3/4 inch female connections on the shower valve? Hi, the fittings on this valve are 1/2 inch. Hope this helps! Q. Are the shower heads themselves made from metal or plastic? The shower heads on this item are made from a quality hard chromed plastic. We find it's best that way, as if you were to accidently drop the handset you could crack some tiles if it were metal, or worse! Great shower and decently priced hope it lasts. Very impressed with the build quality and ease of installation. However concerned that no installation instructions were available. It looks nice and is quite a compact unit. The controls are easy to understand and operate.